GC Super Monkey Ball Adventure (USA) "Challenge Mode" in 12:08.25 by Gonquai. 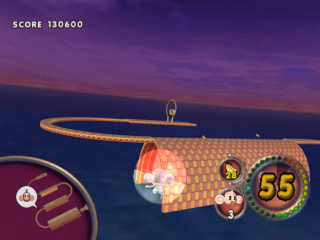 Super Monkey Ball Adventure takes the monkey rolling madness of the previous games and puts a story-based spin on it. Choosing from one of the four monkeys, Players roll their way around the various islands of Monearth, talking to citizens and performing the tasks they request (such as delivering sandwiches, finding a missing baby, rescuing rare flowers, and more) to cheer them up. Gonquai, however, does not play the story mode. Instead, he clears all difficulties of the Challenge Mode in record time.